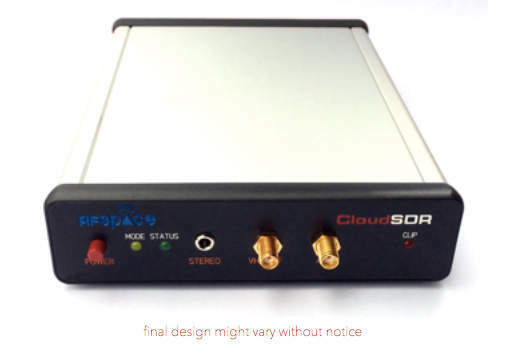 The CoudSDR is the latest offering by the US-based SDR manufacturer, RFspace. At time of posting, the CouldSDR is in beta testing, but expected to ship to consumers in 2015. The Cloud SDR can be used as a traditional computer-connected SDR, much like the RFSpace NetSDR, but with a 1 MHz bandwidth window. The CoudSDR is also a self-contained server that can stream bandwidth video and received audio over the Internet, allowing remote control via a Remote SDR Client or even via a smart phone app. 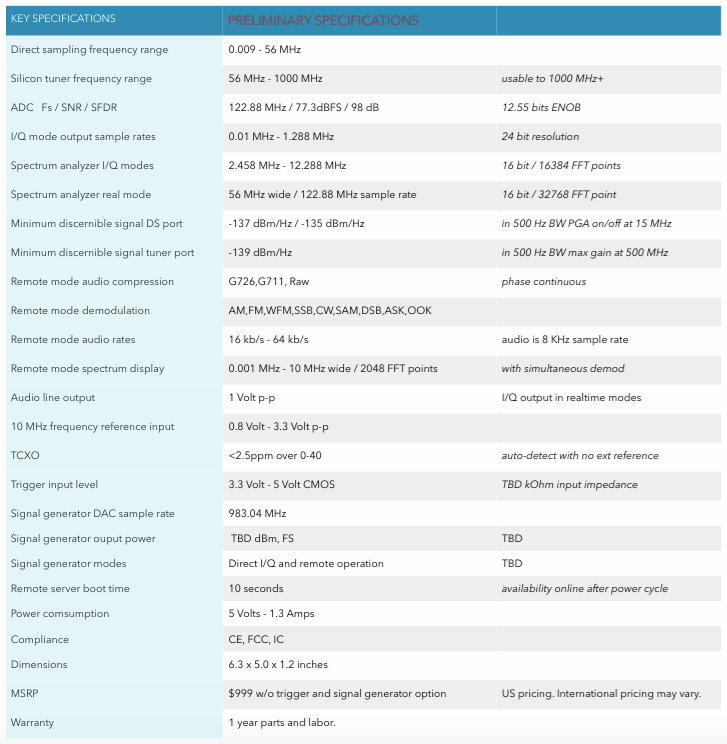 RFSpace has published a comprehensive PDF brochure about the CloudSDR. You can download the brochure by clicking here. Wideband spectrum analyzer mode offers 56 MHz wide spectral captures in both 2D, 3D and waterfall formats. 9kHz low end frequency range allows SONAR, VLF and ultrasound applications. External 10 MHz reference input allows multiple radios to be locked to the same frequency reference like Rb, Cs and GPS disciplined oscillators. An internal TCXO takes over when no external reference is detected. The CloudSDR has both external and internal triggering modes for synchronization of multiple radios as well as triggering at specified intervals. The internal trigger mode allows the phase to be adjusted, as well as the frequency in steps of 1nHz. The built-in remote server allows the CloudSDR to be placed anywhere in the world. A PC running Windows, Linux, Android or MacOS is able to access the radio with very low latency. It does not require a PC at the server side and the server is available within 10 seconds of boot up. An Android application has been developed to access the CloudSDR in remote mode. In addition, an open source client is available license free for Windows, Linux and MacOS. Programming is extremely easy since all of the DSP, FFTs and scaling are done inside the radio. The demodulated audio is available at the radio side to monitor or record the audio. The audio port switches to a 192 KHz capable analog I/Q output when in I/Q streaming mode. Optional 1 GS/s digital upconverter and signal generator can generate modulated and CW signals remotely or direct connect in the 100 KHz – 455 MHz ranges. Specs TBD. This entry was posted in Made in USA, RFSpace, Software-Defined Radios (SDR) and tagged CouldSDR, RFspace, RFSpace CloudSDR, SDR, Software-Defined Radio. Bookmark the permalink.